I love riding in First Class on trains in Europe because it’s a great experience for a reasonable price. When I was looking for train tickets from Vienna, Austria to Budapest, Hungary, I saw an option for Business Class tickets, which was another level higher than First Class. Of course I had to book it to see what this experience was like. I booked my tickets through Trainline and it’s a very user-friendly site and easy to navigate. You will have to create an account which is an easy process as you can use your Facebook or Google account to sign in easily. 1. Select your departure station as Wien Hbf (Vienna, Main Station, Austria) and your arrival station as Budapest-Keleti. Enter your departure date. If you don’t have a return date, you can just leave that blank. Next, enter the number of passengers. 2. Continue on to the next page and from the Filters drop-down menu, select Trains only. You’ll see the various options in times, seats and fares. Only certain trains have the Business Class option, so I chose the 13:40 train. The total cost for the Business Class seat was about $50. For 1st Class seats, it was $33 and for 2nd Class seats, it was $22. Once you make your selections, continue on to the next page and purchase your ticket. You can download the Trainline app and keep your tickets and trip details handy on your smartphone. You will still have to print out your tickets and have them on board with you so that you can show the train agent. The Vienna Main Station is a very clean and modern train station. It’s actually one of the nicest train stations I’ve been to in Europe. The station is huge and has many shops and cafes. They also have escalators and elevators everywhere, which might be a weird thing to mention but in Budapest and Bratislava, there were barely any, so we had to use the stairs most of the time. It’s usually not that big of a deal to climb stairs but when you have luggage with you, it becomes a pain. There were digital boards around every corner telling us the arrivals and departures of the trains. It’s very similar to an airport and very easy to navigate where you need to go. We arrived at the train station an hour before our train’s arrival, so the information wasn’t up on the board yet, but after about 15 minutes, our train information popped up and we headed to our platform, which was 9 C-E. I wasn’t sure what the “C-E” meant at first but when I got up to the platforms, I saw that there was a letter next to each number. This indicates where the train will be stopping, so make sure you stand in that area. The train arrived promptly at 13:40, as scheduled, and we found our Business Class seats easily. Our seats were fabulous with lots of room and we had our own sectioned off area. There are 3 seats in each section and it would have been awkward if the third person showed up because it was right across from us and very close. Luckily, no one showed up and we had the section to ourselves. I saw that most passengers had their own section and it didn’t look like they had to share with any strangers. Our section was equipped with a personal digital board telling us the timeline of the train, a reading light, chair extension, outlet, side table, trash bin and a large window. We were able to store all of our luggage above us on the rack. My friend had a medium size suitcase, so there’s plenty of room up there. There was also free wifi on board but I would say it worked half the time. That’s pretty common in my experience when traveling by train. The wifi doesn’t work so well when passing by rural areas but once it nears urban areas, the wifi works really well. We had a server stop by and asked if we wanted anything to eat or drink. My friend ordered a beer but for some reason it took 30 minutes to get it. I’m guessing he was the only server on the train. If you don’t want to wait or just move around, there is a restaurant on the train too with about 4-5 tables. Their menu had an assortment of things including Austrian dishes, snacks, salads and desserts. As I walked through the train to get to the restaurant, I noticed that the 1st Class area was pretty nice too. Some seats had their own outlets as well. I’m not sure if all seats had them. The views were mostly of the countryside but I always enjoy looking at the windmills and Austria has lots of them. 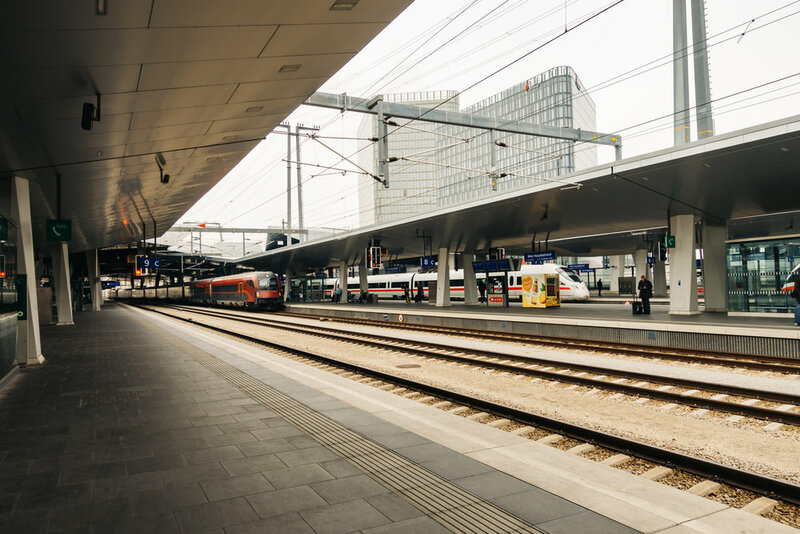 The last stop of our train was at Budapest-Keleti but I realized that the stop before at Budapest-Kelenföld was closer to the hotel we were staying at on the Buda side, so make sure you check which station will work out better for you. I absolutely loved my Business Class experience on the train and would do it again in a heartbeat. The price really isn’t that bad especially when compared to 1st Class seats on flights.